Only about 4% of the total mass of the Universe is made of atoms or ions, and thus represented by chemical elements. Hydrogen is the most abundant element, making up 75% of normal matter by mass and over 90% by number of atoms. It is found in great quantities in stars and gas giant planets, as well as in the interstellar medium. Most of the mass of the Universe, however, is not in the form of chemical-element type matter. It is postulated to occur as forms of mass such as dark matter and dark energy. The first stars that formed after the Big Bang, provided the Universe with the first elements heavier than helium (‘metals’), which were incorporated into low-mass stars that have survived to the present. For example, eight stars in the oldest globular cluster in our Galaxy, NGC 6522, were found to have surface abundances consistent with the gas from which they formed being enriched by massive stars during the early phases of the seeding of heavy elements. Recent study suggests that the very first star might have been born much earlier than previously thought, when the Universe was only 30 million years old. Interesting question about the earliest stars is, were these monsters blue-violet and luminous or dark and glowing infrared? 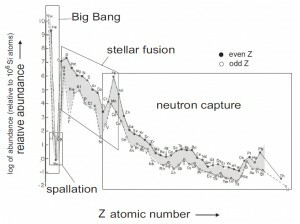 Could the early Universe possibly have had both types? In a place that had not yet witnessed chemical and magnetic stellar feedback, the formation of the first stars is a well-defined problem for theorists. Of 118 known only 94 elements occur naturally. Most of the elements heavier than helium are synthesized in stars when lighter nuclei fuse to make heavier nuclei. The process is known as nucleosynthesis. The rest is produced in supernovae and other violent cosmic events. The material in our sun (and solar system) has been cycled through at least several stars. The more rounds of star birth and death there have been, the larger the ratio of carbon to oxygen. 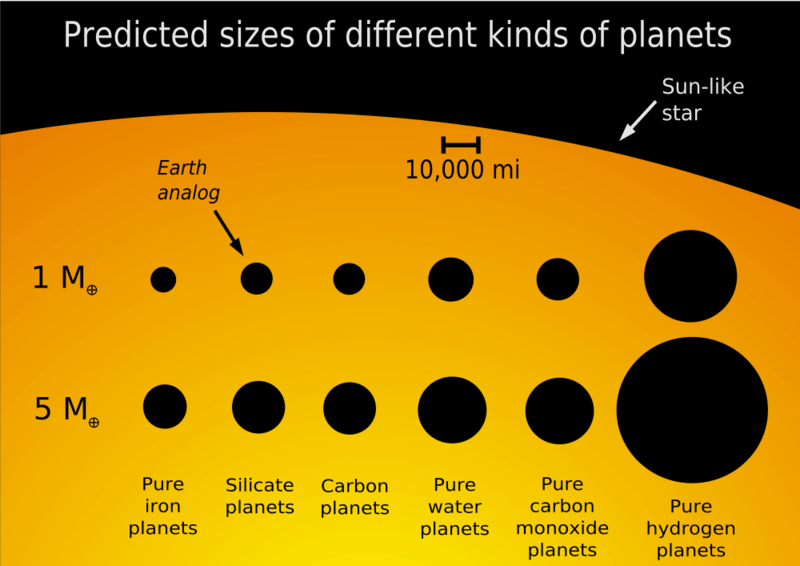 Towards the center of our Galaxy, in the regions of more evolved stellar population, you’d expect to find more carbon worlds than silicate planets like Earth. Similarly, over time, the gas clouds across the whole galaxy are getting progressively more carbon-rich, and in a few billion years, most of new planets might turn out to be carbon worlds. As the Universe ages, one might ask, is there a possibility of appearance of yet unknown elements with changes in stellar populations? Well, no. In our present-day Universe naturally occurring exotic Unobtanium is unlikely. Even if technology is involved, the existing periodic table plus some antimatter (anti-hydrogen anyone?) is all we get. Perhaps, in another universe with slightly different laws of physics, allowing such metamorphosis? Who knows? Elemental abundances in the Universe drop off exponentially with increasing atomic number (Z) up to Z ~ 60; thereafter remain almost constant. Even-Z elements are more abundant than their odd-Z neighbors. Li, Be & B show marked depletion relative to both higher and lower-Z elements. Abundance may be variously measured by the mass-fraction (the same as weight fraction), or mole-fraction (fraction of atoms by numerical count, or sometimes fraction of molecules in gases), or by volume-fraction. Measurement by volume-fraction is a common abundance measure in mixed gases such as planetary atmospheres. Assuming that life can only evolve on the basis of carbon compounds, there are several extremely important elements, required for life. By mass, human cells consist of 65–90% water and 99% of the mass of the human body is made up of the six elements, which are oxygen (65%), carbon (18%), hydrogen (10%), nitrogen (3%), calcium (1.5%), and phosphorus (1.2%). Needless to say, life is built from the most abundant stuff, available at the spot. However, note that Earth is silicon-rich and carbon-poor, e.g. has more silicon (27.69%, second after oxygen by mass) than carbon (only 0.094%) in its crust, and life still had chosen carbon as its base; that’s probably universal. Also, hydrogen may be the most abundant element in the Universe, but oxygen has an importance that is disproportionate to its abundance, since it plays a critical role in so many fundamental planetary system processes. The very nature of the terrestrial planets in our own Solar System would be much different had the oxygen/carbon ratio in the early solar nebula been somewhat lower than it was, because elements such as calcium, iron and titanium would have been locked up during condensation as carbides, sulfides and nitrides and even (in the case of silicon) partly as metals rather than silicates and oxides. Extrasolar planets often differ tremendously from the worlds in our solar system. 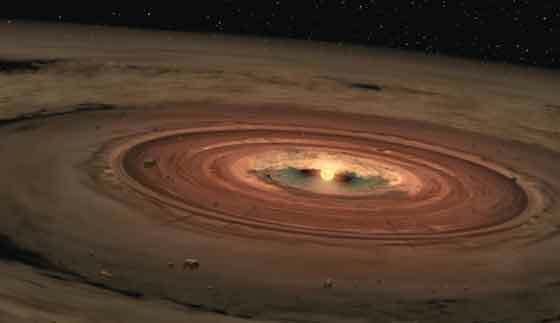 Rather than assume planets around other stars are scaled-up or scaled-down versions of the planets in the Solar System, it is necessary to consider all types of planets that might be possible, given what is known about the composition of protoplanetary discs. 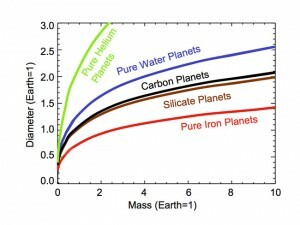 Planets can have a wide range of sizes and masses but planets made of the same material will have the same density regardless of their size and mass. For example, a huge, massive planet can have the same density as a small, low-mass planet if they are made of the same material. No matter what material a planet is made of, the mass/diameter relationship follows a similar pattern. All solids compress in a similar way because of the structure. If you squeeze a rock, nothing much happens until you reach some critical pressure, then it breaks. The same goes for planets, but their operating pressure is composition-dependent. In 2007 a team of scientists have created models for 14 different types of solid planets that might exist in our Galaxy. The 14 types have various compositions, and the team calculated how large each planet would be for a given mass. Some are pure water ice, carbon, iron, silicate, carbon monoxide, and silicon carbide; others are mixtures of these various compounds. Planets fall into different classes, with our solar System being represented only by two of them – rocky terrestrials and gas giants. But rocky planets almost as big as Uranus seem far more common in the Universe than suspected. These Super-Earths, now an officially defined planet class, have masses in the range from Earth to Uranus, exactly the range that is missing from our Solar System. Terrestrial planets have overall densities around 4-5 g/cm^3 with silicate rocks on the surface. Silicate rock has a density ~ 3 g/cm^3 and iron has a density ~ 8 g/cm^3. Ocean planets will probably be somewhere between 2 and 4 g/cm^3 (depending on interior materials), and gaseous planets are thought to be holding at ~ 0.6 – 2 g/cm^3 (check out Saturn, which is less dense than water!) but there were some surprises as well. In 2006 a planet with extremely low density was discovered. This extrasolar planet, TrES-4b is 70% larger but actually less massive than Jupiter. With the large size, and lower mass, the planet has a low density of only 0.22 grams per cubic centimeter, and is probably composed of hydrogen and helium. And this isn’t the sole case. Currently there is a whole group of such diffuse “puffy” planets. These gas giants with a large radius and very low density sometimes are called “hot Saturns”, due to their similar density to Saturn. 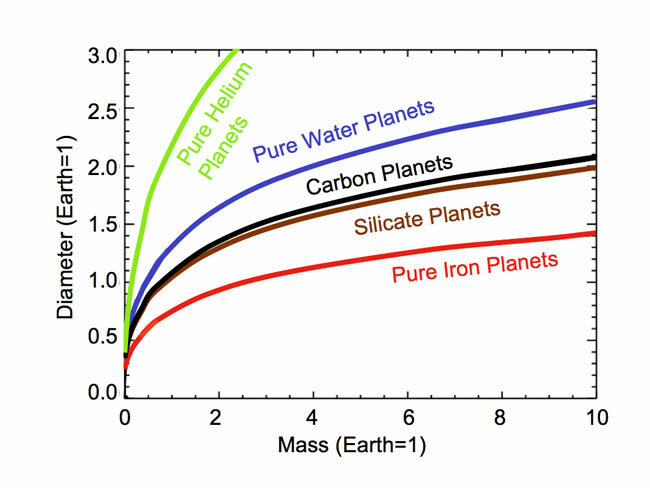 Terrestrial planet’s bulk density can be approximated as rho_planet = rho_earth*(Mplanet/Mearth)^0.2, where Mplanet and Mearth are body masses and rho_earth is the mean density of Earth. The uncompressed density of such planet would be earthlike, and so will the composition. More massive objects have stronger gravities. As a result, more massive objects get more compressed than less massive objects. This compression means that the bulk density of the object will be greater. Uncompressed density is free of mass dependence. Now summing up all things previously said, composition along with planetary mass plays a vital role for habitability potential, allowing or restricting such things as atmosphere, magnetic field and plate tectonics to create ocean basins, with volcanism driving carbonate-silicate cycle, and, eventually, life. 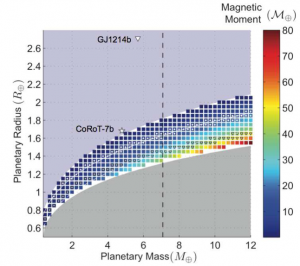 Very small terrestrial planets (around or less than 0.3 Earth masses) are less likely to retain the substantial atmospheres (because of low gravity) and ongoing tectonic activity probably required to support life. By “ongoing” I mean several billions of years. The same is with the upper mass limits. Very large terrestrial planets (perhaps, larger than 2 Earth masses) might have some problems with becoming geologically dead faster than life might evolve there, or being hyperactive, reshaping their surface quite fast. I will talk about plate tectonics (and maps!) in details somewhere in the following posts, so I’m not going to focus on that here. Then, there is another issue with the size. In 2010, model simulations of rocky super-Earths between 2 and 10 Earth-masses showed that high pressures could keep their cores solid instead of molten, which would prevent a magnetic field from forming to protect developing surface life from stellar radiation. Other scientists argue that the interiors of super-Earth may still get hot enough to melt their iron cores despite the pressure due to other factors not yet considered by the model simulation. Planets in HZs are exposed to stellar winds; the closer to the star, the denser the wind. Without a magnetic field generated by a rotating molten metallic core, the atmosphere of such a planet would also face progressive erosion by the stellar wind of its host star. The planet, even if rotating slowly (as in tidally locked), can have strong magnetic shielding given the suitable mass, size, chemical composition and effective convection in its interiors. This was very well shown in the model by Barnes et al, 2010. 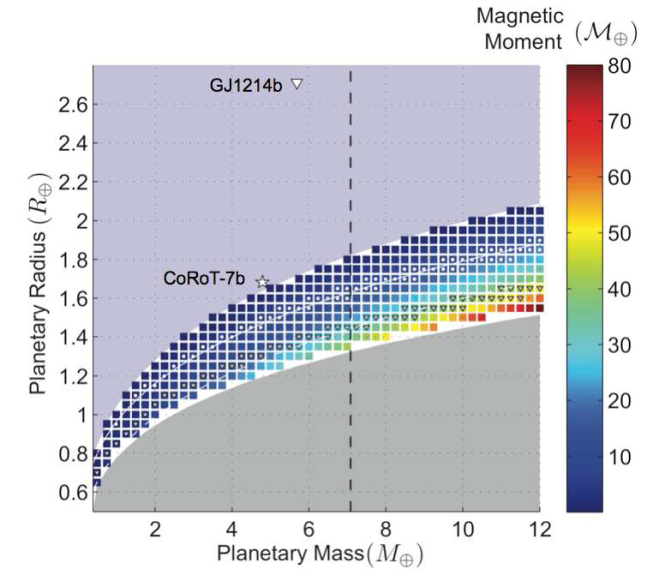 The image represents magnetic moment model estimates for planets up to 12 Earth masses, a pure iron core, and perovskite/ferropericlase mantle compositions. The color scale on the right corresponds to magnetic moment values between 0 and 80 times that of the Earth. The region below the colored squares corresponds to planets made out of core materials denser than iron, while the region above corresponds to planets with radii too large, and therefore too low density, to have a core capable of generating a magnetic field. 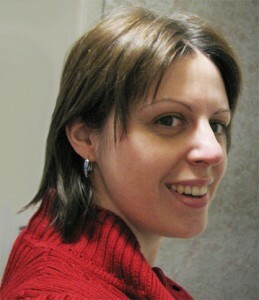 However, note that planets under extreme conditions (i.e. highly inhomogeneous heating or very strong stellar winds), will have their magnetic fields affected. All this corresponds pretty well with the previous model. Consider now a habitable ocean planet. In order to protect the ocean from evaporating you need an atmosphere. A magnetic field is necessary to prevent the atmosphere from eventually being stripped away by stellar wind. Also, a planet too close to its star or a giant planet (in case of a satellite) can be a subject to serious tidal heating. So give a thought about planet’s interiors and how they work.